An automated external defibrillator (AED) is a portable unit, designed for people with no medical knowledge, which can administer a measured electrical shock to a heart attack victim in order to re-establish a steady heart rhythm. Standard CPR (the traditional ‘first-aid’ approach) on a heart attack victim provides a 5% chance of survival, but access to a defibrillator improves that to a 50% chance. Following a cardiac arrest, the chance of survival decreases by 23% per minute. Shipton has an AED located in the old phone box at the bottom of Kilham Lane. The unit is designed to require very little maintenance and is housed in a locked, weatherproof cabinet, to ensure it is always ready for use. It is regularly checked by the VETS team. Since the phone was decommissioned BT kindly provide the electricity for the Defibrillator free of charge for the first seven years. Installation of the defibrillator was organised and funded by Shipton Parish Council working with the Community Heartbeat Trust. The unit has its own automated instructions using a synthesised voice and when applied to the patient will assess whether a shock is appropriate and if so, how strong it should be. A group of volunteers from the village, officially called the Village Emergency Telephone System (VETS), are willing to respond in the event of a Cardiac Arrest in the village. In addition to a number of other village residents, the volunteers have been trained in how to recognise a Cardiac Arrest, how to undertake CPR and how to administer the defibrillator. 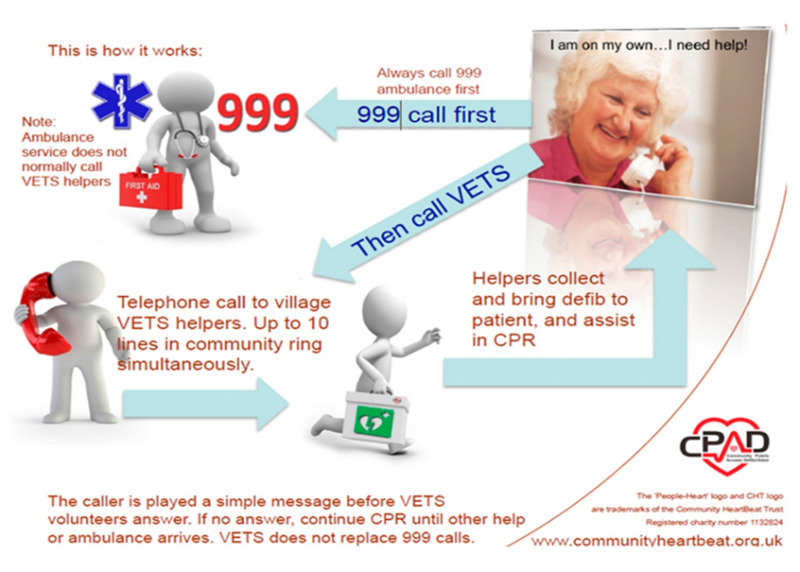 There are six households in Shipton on the VETS system, so one of them should be able to answer the call and bring the defibrillator from the phone-box to the patient, allowing the person who called 999 to remain with the patient.